Gregory Haywood Merritt entered this earthly world on July 29, 1962 and crossed the threshold into eternal rest on April 1, 2019. Gregory was born to the late Louis Haywood and Mary Catherine O. Merritt. Greg was affectionately called by many “Fresh or G-Money.” Gregory had a winning smile, loved to dress and was the life of the party like his late mother. Greg loved to drive nice cars. Gregory loved to cut up, have a good time, and enjoyed making others laugh. Gregory growing up was a mischievous child. He would often have many of his friends over and they would get into stuff as little boys do, bothering his older sister Brenda. Greg was spoiled rotten. He would so often boast to my mom, how he had only received one spanking in his entire life, because he was cutting up in church. Greg gave his life to Christ at a young age at New Liberty Baptist Church in Louisburg, NC and he later rededicated his life to Christ at Good Hope Baptist Church. Greg was a graduate of Wake Forest Rolesville High School, Wake Forest NC in 1980. He majored in Business at Wake Tech Community College. Shortly after high school, he began working at Burlington Mills, a textile company operating machinery. He later worked for Mallinckrodt Chemical Plant as a chemical specialist where he worked for many years. He united in Holy Matrimony to Joyce Goodson of Raleigh, NC in 2003. Greg enjoyed being around family and friends and he loved his wife! If you every had a conversation with Greg, Joyce (puddin) name was sure to come up. G-Money enjoyed being the center of attention as he was the “baby boy” of the family. Gregory thought he was a professional dancer. He believed he could out dance anyone. Gregory as my mom would say, “was too cool for school.” Greg as we all know was a character! Greg leaves to cherish his precious memories his wife, Joyce G. Merritt; daughter, Kai'sha Merritt of Raleigh, NC; sons, Je'Quan Dunston of Wake Forest, NC; and Eric Dickens of Raleigh, NC; stepdaughters, Chanel Morgan and Sherrell Morgan both of Raleigh, NC; grandchildren, Je'Darian Dunston, De'Marius Dunston, Anjell Dunston, Kemora Davis, and Kamaria Shaw all of Wake Forest, NC; sister, Brenda M. Vinson (James) of Knightdale NC; uncle, James N. O'Neal (Betsy) of Franklinton NC; aunts, Frances O. Williams of Silver Springs, MD, Della O. McCowan (Arthur) of Laurel, MD, Ella O. Bolden of Franklinton, NC and Hattie S. Merritt of Raleigh, NC; nephew, Derrick Merritt; great-niece, De'ja Merritt; special friends, Wayne Jones of Raleigh, NC and Larry Crawford of NJ; and a host of nephews, nieces, cousins, other relatives, and friends. 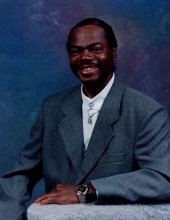 To send flowers or a remembrance gift to the family of Gregory H. Merritt, please visit our Tribute Store. "Email Address" would like to share the life celebration of Gregory H. Merritt. Click on the "link" to go to share a favorite memory or leave a condolence message for the family.